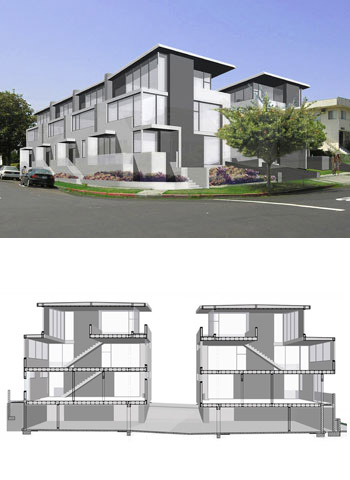 This 8 unit residential project takes the form of attached row houses, but are single family loft townhouses allowed under the new small lot ordinance. This vertical living concept is inspired by the walk-up Brownstone’s throughout the east cost. 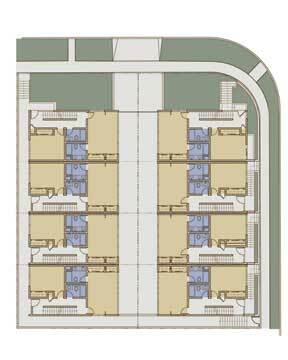 The corner lot plan includes 2 rows of 4 units with a common vehicular drive to access each unit’s garage. In keeping with the houses common to the neighborhood 5 of the 8 units face the streets with a front door and covered porch. The public/private arrangement of the unit has been flipped with the living level on the top floors to allow two story spaces with a loft.